I'm guessing that it's the cooler weather that is suddenly making everyone think about scarves and other cosy clothing. The most "repinned" pin on my Pinterest boards is for a scarf made out of a T shirt. The activity around this topic has been especially heavy lately, with 15 people repinning or liking this pin in just 2 days. So I thought I should make up a few samples. My first scarf turned out very well. Really, it is all a matter of finding the right kind of T shirt to start with. This sample is made from a good quality XL shirt which rendered up loops almost a metre long. 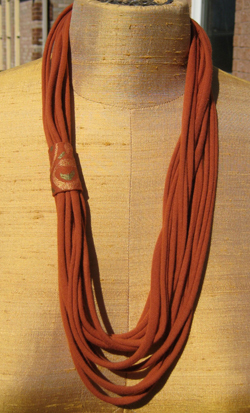 As a result, it can be worn wrapped twice or thrice, or looped through it self. It's made from 17 tubes so it has a nice bulk, but is very light and soft. The tubes are held together with a simple wrap made from a short length of tube cut from the sleeve. The T shirt used for this example had long sleeves. So I had the potential for a lot of short tubes that were not closed loops. Hmm, what to do? How about a bracelet? For this example, the ends of the tubes had to be connected. I stitched them together on a bit of scrap fabric, rolled it tightly and covered the join with a bit more of the left over T shirt. This made a nice little spot for a bit of embroidery. But contrasting fabric, beading, trim or textile paint would be other good options for decoration here. The first one I made (left) came out a little snug for me. Good thing my sister has smaller wrists. The formula for the length of the tubes for a double wrap bracelet is 2 times your wrist plus about 5 cm. 6 or 7 tubes is plenty for this or the bracelet gets too bulky. These are cozy, easy to wear and don't clank against your laptop while you are typing. There are many web tutorials on how to make these dead-simple scarves. Essentially, you cut across the body of a T shirt creating long loops of fabric. Then you stretch the strips until the fabric rolls into a tube. And finally you grab a bunch of tubes and sling them around your neck. OK in a pinch. 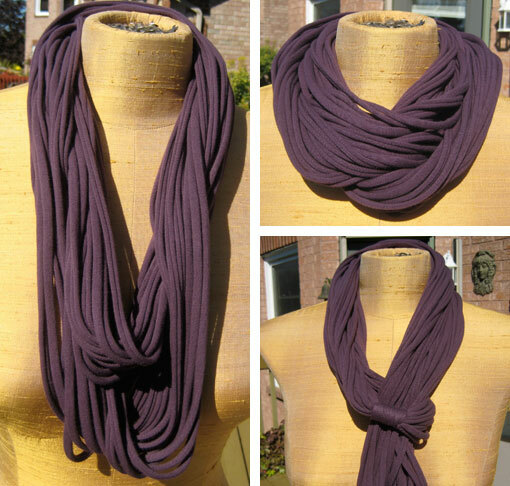 But if you want this scarf to look really good, there are things you can do to improve the process, fit and finishing. Hope these pointers help! First, and most importantly, you need to get your hands on a T shirt that has no side seams. This is easier said than done in my experience. Other than men's basic thin undershirts, these were hard to find in my local stores. I checked out Goodwill and Value Village, but the few there were either white (well, used-to-be white) or had printing on them. The printed ones might be interesting to try, but I was not sure how well the printed areas would stretch, being a bit stiff with ink or plastic transfer. I'll experiment with one of these and post results later. The best I found for this project was a very good quality Denver Hayes shirt from Marks Work Wearhouse that comes in some great colours for the fall. But at about $17, you need to be very sure that you want this scarf! Luckily I found a couple on their sale rack for $6 for my first try. The quality really made a difference to the finished scarf. The size of the T shirt does matter. The bigger the shirt, the longer the tube loops will be. This particular shirt (size XL) was 64 cm wide. When stretched, the loops where almost a metre long. This length allows me to wrap the scarf generously either 2 or 3 times, or loop through itself. I like long scarves and necklaces, but if you want a shorter scarf or a single wrap, go for a smaller size. You'll find this much easier to make if you have a rotary fabric cutting tool. Scissors will work but the edges of the tubes will be rougher. I tried both and the smoothness of the rotary cut tubes really makes a difference to the finished quality. I cut my strips 2.5 cm wide, across the body of the this heavy quality shirt. The resulting tubes when stretched are about 1 cm wide. The first loop that you stretch will surprise you. They vastly increase in length! The narrower you cut the strips, the narrower the tubes will end up. But be careful – if your fabric is very thin, cutting the strips less than about 2.5 cm can be a problem as they can rip when stretched. Both shirts I used stretched well. 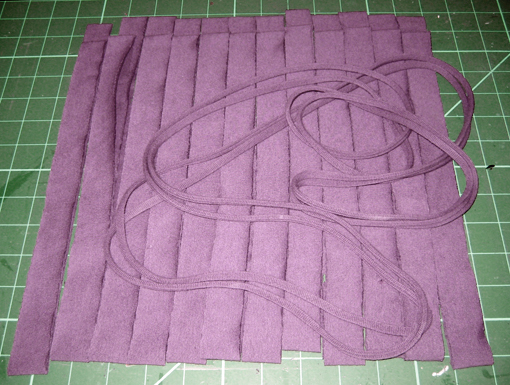 And although I cut the strips the same width for both, the heavier fabric resulted in thicker tubes. Bonus: this good exercise for your chest and shoulders. 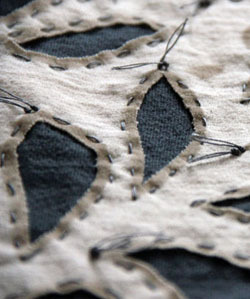 This is where you can make your scarf superior to some others that you'll see on the web. How you connect them together will make a difference. An easy choice is to wrap tightly with some spare tubing. Start by wrapping over one end of the tube and finish by threading the other end back under the wrap using a bodkin or large eye needle. You could also knot the ends for a more casual look. A self fabric cover is another option. Cut a piece of left over T shirt to the size you want, plus a centimetre or so to turn under on all sides. 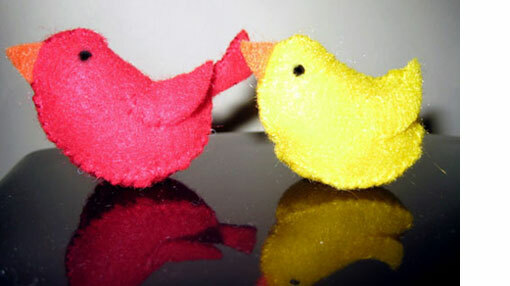 You can paint or stamp this scrap before sewing around the bunch, or embroider or bead it later. A contrasting fabric would also be great here. 5) What if you only have a T shirt with side seams? If you can only find a shirt in the colour you want with side seams, you are not completely out of luck. However, you will not be able to make a very long scarf without joining the tubes in some way. So you can either make a shorter scarf, or be prepared to have two seam covers to manage in your design. In this example, I used a men's 2XL copper brown shirt from Walmart ($5). The resulting tubes were about 50 cm long, so I knew that the scarf would not be long enough to loop twice around my neck. Instead, I actually shorted all the strands, grading the lengths over 5 cm to give a nice graduated effect like a multi-strand necklace. To finish this sample, I stitched all the tubes in order to a piece of scrap fabric, then trimmed the excess fabric away. I then rolled it up tightly and stitched it closed. The cover is a scrap of fabric, decorated with textile paint, heat set and attached as described above.